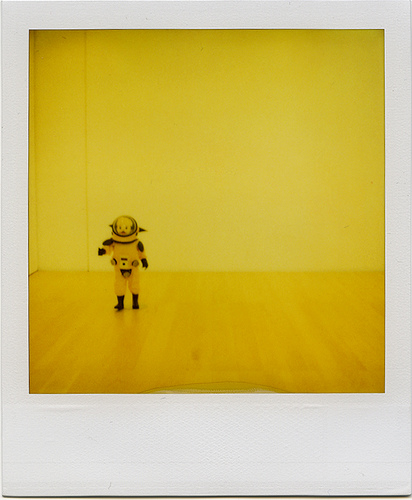 Yellow Suit by Kenji Yanobe. 1992. 91 x 120 x 120 inches. Furthermore, as you think about your project, invention, or installation, think whether you would like to work alone or in a group. If you choose a group, think carefully about the skills that each member brings to the table and make sure the capabilities are balanced. What can your local community bring to your project? What resources are there out there in your community environment that will bring knowledge and approaches to your art invention idea? Think if you want a temporary or permanent piece, continuous or intermittent piece, autonomous or operator-activated piece or installation? Would you like a gallery to be able to construct the work (plug and play) or will you have to travel to construct the work each time? 3)	Materials availability how long to get materials. Most often overlooked. Order early and confirm the time that your materials will be available. Are there alternative sources? Do you trust that your sources are going to come through? 4)	The people necessary to realize the project and their availability. 5)	The learning curves necessary to learn the new material. 6)	Are the tools available for the project? If you are pursuing this text in a class you should present your idea to the class in an approval brainstorming committee that will make suggestions as to possible problems and solutions and the aesthetic merits of the work. CAVEATS: KISS principle (keep it simple and stupid). Use existing systems, rather than reinventing a mechanism. Make three rough sketches of your idea without editing or concern for how you will make the ideas work. Just let your imagination wander and think about your interests here. Be far out and crazy and do not self-edit at this stage.